The book is also available on Kindle and in Print at Amazon. The Kindle Edition is currently for free for several days. In preparation for Mary’s presentation in the Temple, Saint Alphonsus tells us to detach from something to which we are most attached. Prayer to be said privately at one or more visits to the Blessed Virgin Mary: Oh Mary, during this novena help me to detach from ___________, to which I am most attached and serves as an obstacle to my service of Almighty God and thee. Start the Novena on November 12th. Oh beloved of God! most amiable child Mary! oh, that like thee, who didst present thyself in the temple, and at once and wholly didst consecrate thyself the glory and love of thy God, I might offer to thee to-day the first years of my life, and dedicate myself entirely to thy service, oh my most holy and sweet Lady! But it is now too late, for, unhappily, I have lost so many years in serving the world and my caprices, as it were entirely forgetful of thee and of God. Alas for the time in which I did not love thee! But it is better to commence late than at all. Behold, oh Mary, to-day I present myself to thee, and offer myself entirely to thy service, for the longer or shorter time that remains for me to live on the earth; and with them I renounce all creatures, and dedicate myself entirely to the love of my Creator. I consecrate to thee, then, oh queen, my mind, that I may always think of the love that thou dost merit, my tongue to praise thee, and my heart to love thee. Accept, oh most holy Virgin, the offering which the most miserable sinner presents to thee; accept it, I pray thee, for the sake of that consolation which filled thy heart when in the temple thou gavest thyself to God. And if late I begin to serve thee, it is right that I should make good the time lost by redoubling my devotion and my love. Aid my weakness, oh mother of mercy, with thy powerful intercession, and obtain for me perseverance and strength to be faithful to thee until death; that always serving thee in this life, I may come to praise thee eternally in paradise. 1. Make a meditation morning and evening. 2. Pay Mary three visits to an image or statue and ask her for the grace to overcome the attachment to that thing we are most attached in the world. We should thank God for the many graces He has given Mary. On the Feast of the Presentation of Mary. 1st. The holy child Mary, having hardly arrived at the age of three years, entreated her parents that she might be placed in the temple according to the promise which they had made. The day appointed having arrived, the immaculate young Virgin leaves Nazareth with St. Joachim and St. Anne, accompanied by a host of angels who attend that holy child who was destined for the mother of their Creator. Go, says St. Germanus, go, oh blessed Virgin, to the house of the Lord, to await the Holy Ghost, who is to come to render thee mother of the eternal Word. 3d. Thus Mary, a young virgin in the temple, did nothing but pray. And seeing the human race lost and hateful to God, she especially prayed for the coming of the Messias, desiring then to be the servant of that happy Virgin who was to be the mother of God. Oh, who would have said to her then: Oh holy Lady, know that already through thy prayers the Son of God is hastening to come and redeem the world; and know that thou art the blessed one chosen to be the mother of thy Creator. Oh beloved of God, most holy child, thou prayest for all, pray also for me. Thou hast consecrated thyself wholly, even from infancy, to the love of thy God; ah, obtain for me at least that during the remaining years of my life I may live for God alone. Today together with thee, I renounce all creatures, and consecrate myself to the love of my Lord. I also offer myself to thee, oh my queen, to serve thee forever. Accept me for thy special servant and obtain for me the grace to be faithful to thee and to thy Son, that I may come one day to praise thee and love thee eternally in paradise. 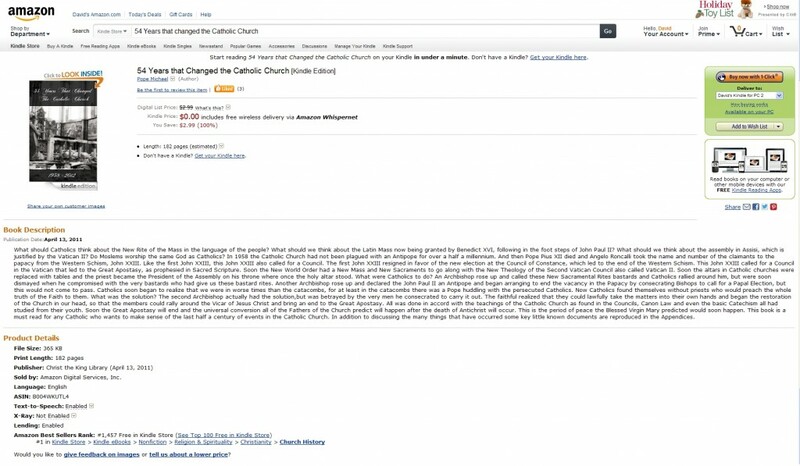 We just found out that 54 Years that Changed the Catholic Church is number 1,4547 in Kindle Books. Consider that this is competing with about a million books on Kindle. Click through and get a copy today.